well known as a publisher of funny animal comics. Nutsy Squirrel was the star of Funny Folks, one of its early titles devoted to that genre. The character was created by writer Woody Gelman and artist Irving Dressler, both of whom were better known for work in other areas of the cartoon field. Gelman was the publisher of Nostalgia Press, which reprinted classic newspaper comics such as Flash Gordon and Little Nemo, while Dressler was an animator on Famous Studios' Little Lulu, Hal Seeger's Milton the Monster, and more. Neither Gelman nor Dressler stayed with Nutsy for very long. The comics creator most associated with the series was Rube Grossman (Three Mouseketeers, Rudolph the Red-Nosed Reindeer). Nutsy Squirrel was, as implied by the name, a squirrel who wasn't entirely rational. In the beginning, he was partnered with Robert Rabbit, who was a little smarter but prone to irritation with Nutsy's lack of reasoning power. Later, Robert was dropped. Nutsy's new foil was a human-style toon called The Professor, whose cap and gown indicated a certain level of erudition, but who, despite evident education, wasn't really much smarter than Nutsy. In 1950, DC seems to have decided its funny animals would benefit from an apparent connection to movie cartoons, even if most of them didn't really have one. Leading Comics (where Peter Porkchops was the star) was changed to Leading Screen Comics, and Animal Antics (starring Raccoon Kids) became Movietown Animal Antics. Accordingly, the title Funny Folks was changed to Hollywood Funny Folks with its 27th issue (September, 1950). And that wasn't its last title change — with #61 (October, 1954), Nutsy became the star indeed, as the comic was renamed Nutsy Squirrel. But it didn't stay that way for long, as DC's foray into funny animals began to run out of steam in the mid-1950s. Only two issues were published in 1956, and only one in '57. The 1957 issue, #72 (dated November of that year) was the last. 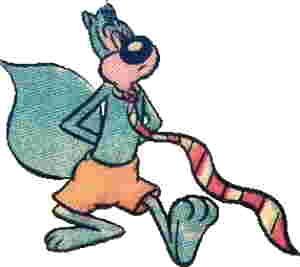 Since then, Nutsy Squirrel has very rarely been seen in reprint form, and even more rarely in a new story, even a guest appearance with another character. Like all of DC's funny animals, he's dropped almost completely out of sight. Text ©2004-06 Donald D. Markstein. Art © DC Comics.